Exploring the magnificent Yosemite National Park should be on every adventurer’s bucket list! Colossal mountains, sparkling streams, and gushing waterfalls combine with beautiful weather to create the most glorious setting for a journey through the great outdoors of California. If you haven’t participated in one of the many Yosemite tours that are available, this is the ideal way to fully appreciate this area’s countless fantastic features. You’ll be able to learn about this park’s unique history, as well as admire breathtaking views of some of the most picturesque parts of the region. Discover some of the best Yosemite tours to take of this famous national park to help you start planning the trip of a lifetime! You'll discover a wide variety of options to choose from when you check out Yosemite Family Tours! From gold panning to fly fishing, their exciting tours will surely leave you with an experience you'll never forget. Many visitors love their unique Stargazing Tour, which allows you to see this area from an entirely different perspective. You're guaranteed to have a day to remember when you take a tour with YExplore! In addition to their hiking and backpacking trips, they also offer fantastic Photography Tours so you can return from your vacation with incredible photos to commemorate your trip. Not only will you be able to admire gorgeous scenery and natural features on a tour with Lasting Adventures, but you'll also be able to learn more about the great outdoors than you ever have before! Their outstanding Outdoor Education program helps teach interested individuals about all kinds of topics related to nature, such as geology, environmental science, natural history, backpacking skills, leadership skills, and so much more! Marvel at the wonders of this national park while you enjoy a fun tram ride! Yosemite Valley Floor Tours are an entertaining way to see the extraordinary highlights of this area. These trams are open-air during the warmer months and enclosed in a heated coach during the colder weather. With a duration of about two hours, these tours are led by knowledgeable guides who can teach you everything you need to know about Yosemite National Park. Learn about the geology, wildlife, and history of this world-renowned park when you spend a day with Discover Yosemite! Their numerous Yosemite hiking tours include full moon hikes, private hiking tours, and a Yosemite one-day tour. You’ll be able to observe some of this park’s most incredible features, such as Sentinel Dome, Glacier Point, Bridalveil Falls, Cathedral Spires, and much more. Enjoy one of the best national parks tours from the comfort of a deluxe bus! The Yosemite National Park offers guided bus tours of the park’s most iconic attractions all year long. You can choose from three different Yosemite Guided Bus Tour options: Glacier Point, Yosemite Valley Floor, and the Tuolumne Meadows Hikers Bus tour (which is completely free!). This is an efficient method of getting around this enormous park while still experiencing incredible views. Great for the whole family, Yosemite Close Up Tours offers a one-of-a-kind excursion in the great outdoors! These expert guides will lead you through an intriguing journey through this park; gourmet lunches are included to ensure you have the best day ever in Yosemite National Park! Complete your Yosemite experience by treating yourself to a stay in the most luxurious lodging possible! 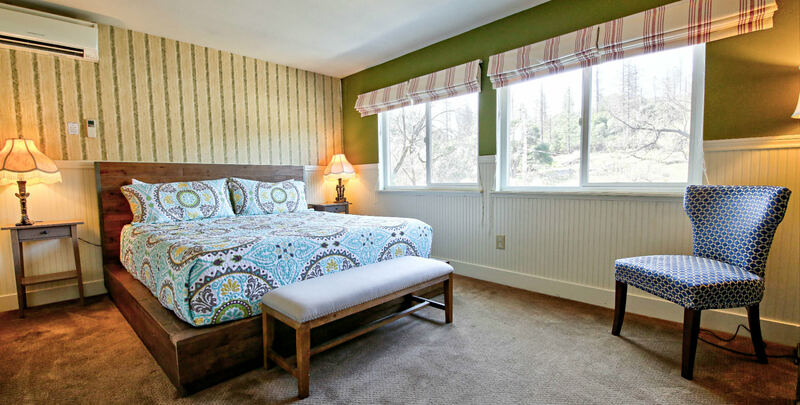 Hotel Charlotte is a historic boutique hotel in Groveland, California, located conveniently at the gateway of Yosemite, that offers comfortable furnishings and excellent amenities within a charming, rustic environment. Choose from staying in one of our twelve lovely rooms or renting one of our cozy vacation rentals. You can explore the many attractions of our surrounding area, or simply spend time unwinding in our relaxing environment; we have an elegant living room, friendly and helpful staff, and even our very own restaurant to accommodate all of your needs! Don’t wait another minute to start planning your dream vacation; check our availability and book your stay today!